POTTERY AVENUE brings this CLASSIC ELEGANT TIMES Baguette Platter in Polish Stoneware from “Boleslawiec” brings in a vintage vibe to your dining collection as it brings with it an element of exclusivity along with the timeless grace associated with the bygone era. Serve next to our Cracker-Olive tray. POTTERY AVENUE brings this ELEGANT TIMES medium size Baguette Platter in Polish Stoneware from “Boleslawiec” bringing in a vintage vibe to your dining collection as it brings with it an element of exclusivity along with the timeless grace associated with the bygone era. 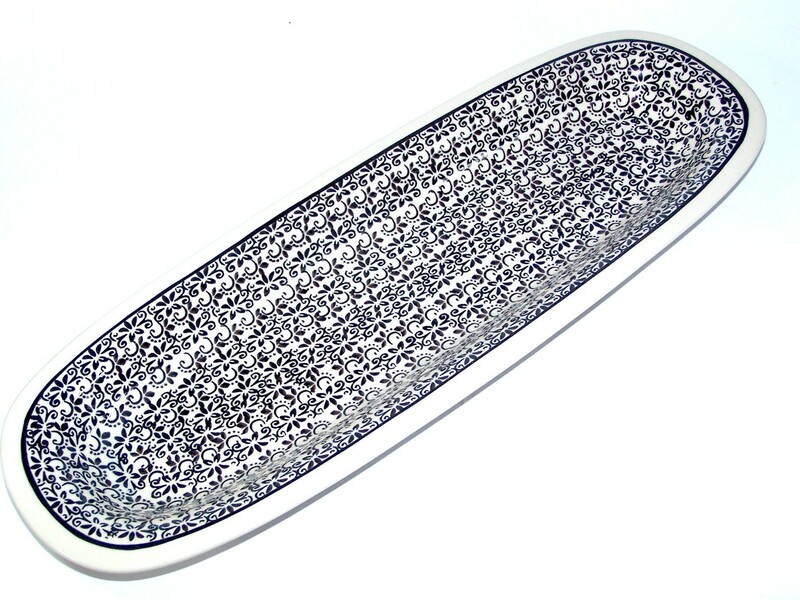 The expertise of “Boleslawiec” Polish artisans can be witnessed in the artistic brilliance of the sleek and long shape exhibited by the baguette platter. It features a subtle curve around the edges to grant an interesting oblong look to the rectangular design of this Polish Pottery. Enjoy this beautiful plate! It is great for holding all of your sandwich fixings, chips and dip (we’ve got the perfect bowls!) and more! Serve it next to our Cracker-Olive tray, and you’ll be amazed at how easy it will be to satisfy your guests.